Well off we go – the drive down from the East Midlands down to Southampton isn’t the shortest of journeys I have ever done to join a ship, but it certainly isn’t one of the longest either. But, at 188 miles, it is certainly some distance! We’re heading down to Southampton before we join MSC Cruises’ MSC Magnifica tomorrow for a wonderful 14-night voyage around Northern Europe and the Mediterranean. But first, we wanted to catch some footage of P&O Cruises Azura and Britannia as they both head out from Southampton with a bunch of excited new passengers starting their voyages. We decided we’d head directly to Hythe originally, but the ships aren’t in view for a huge amount of time for what we wanted to do. So, instead, we decided to head to Calshot as the ships have to slow down whilst they navigate the shallow waters in the Solent near the Isle of Wight. Three hours and forty minutes later, we arrived at the blustery near-winter scene that was the little carpark at Calshot Beach. Not many souls were actually outside, rather sat in their cars spectating. We hopped out, Sara took the DSLR and went off to take photos of Azura as she made her first turn and I unpacked our drone to try to get some good aerial shots. Unfortunately, it was a bit too windy and by the time I had done all the preflight checks and sent him off towards Azura she was a little too far away. Nevermind, brought it back to land. 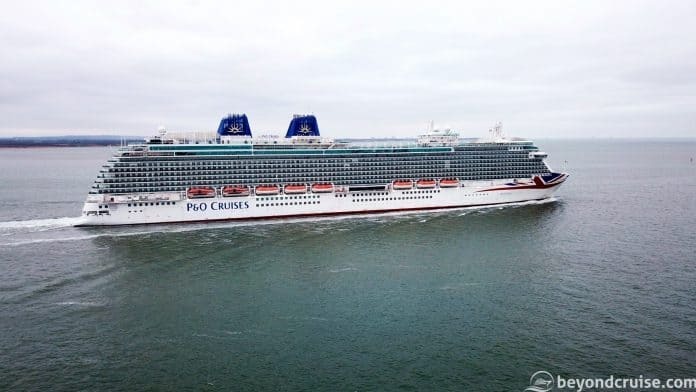 25 minutes later it was Britannia’s turn, she passed Calshot Castle, sounding her whistle and started making her first starboard turn towards the Isle of Wight. I sent out the drone and took a few shots and some small amounts of video, but unfortunately, the wind hampered us again in getting some decent footage. However, here is a short clip we did manage to get! After both ships left, we set off on the 30-minute journey back to Southampton. 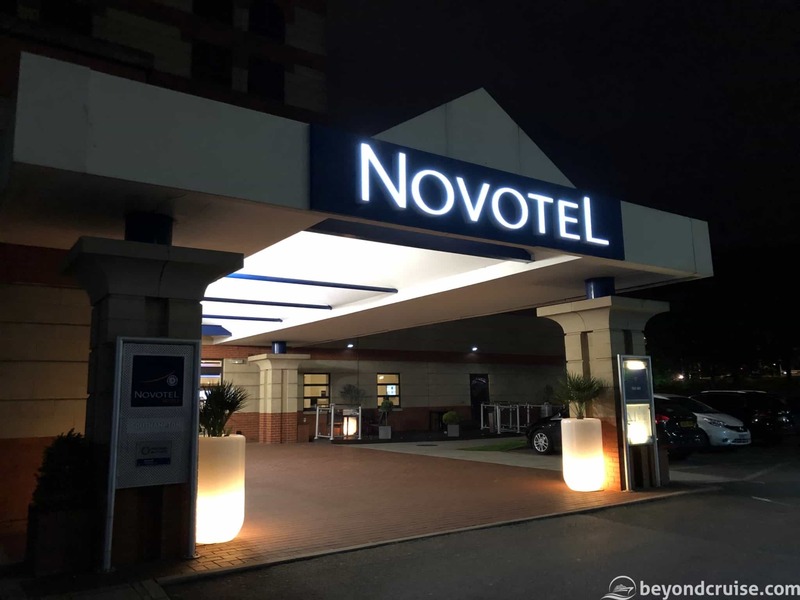 Once arrived, we stayed at the familiar Novotel Southampton, which while isn’t expensive, it isn’t budget either. (Car-parking at any of the three hotels here costs you £7 per night too). 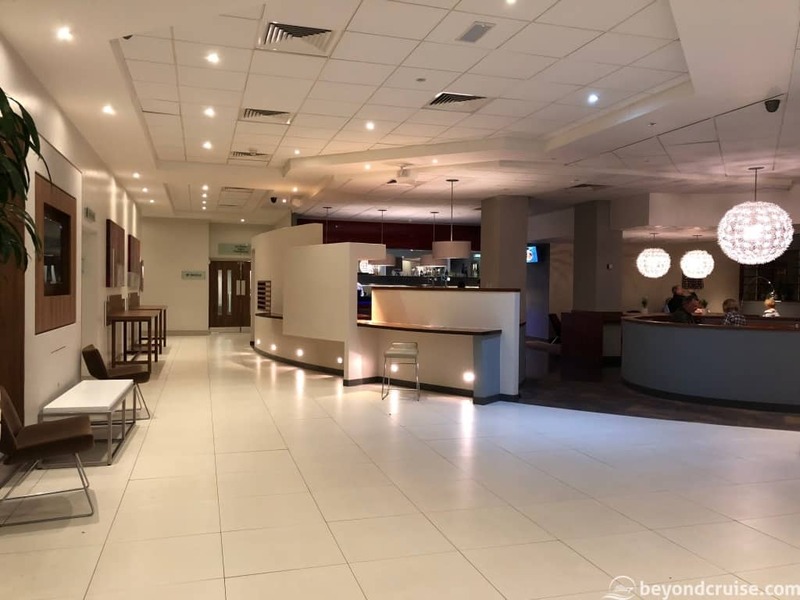 The Novotel is a nice hotel, with a small gym, restaurant/bar and friendly staff. Wi-Fi is free and the location is perfect. It is just a 15-20 minute walk to the WestQuay shopping centre and the city centre from here. After a pleasant meal in the hotel restaurant, we retired to the room to work on editing photos and videos from earlier (this is going to be a pattern throughout the cruise I expect!). After a quick check to see where our ship was, it was time to get some sleep! We look forward to telling you all about our first day onboard the ship tomorrow! If you can’t wait, follow our social media channels for updates too!